Mumbai, India – Tubelight’s special event turned out to be one hell of a gala night as the world finally met the star of the film – Matin Rey Tangu. Present at the event was Salman Khan, Sohail Khan, Kabir Khan, Amar Butala, Nakash Aziz, Amit Mishra, Jubin Nautiyal, Javed Ali and of course the adorable Matin Rey Tangu who stole the show with his entry. The makers kept up the intrigue quotient on Matin and his special connection to Salman in the film. The child star was the grand unveil in other words the surprise package of the evening. Salman Khan was at his candid best as he interacted with the press. A group of dancers swayed to a medley of Tubelight tracks onstage following by smashing performances by Nakash Aziz and Javed Ali. Javed Ali also gave us a glimpse of the new track Kuch Nahi. Jubin’s rendition of the song Tinka Tinka left the audience moved and emotional. Matin took to the stage amidst hoots and cheers beckoning the audience to welcome him. Joined by Amit Mishra onstage, he danced to the super-hit Radio song. 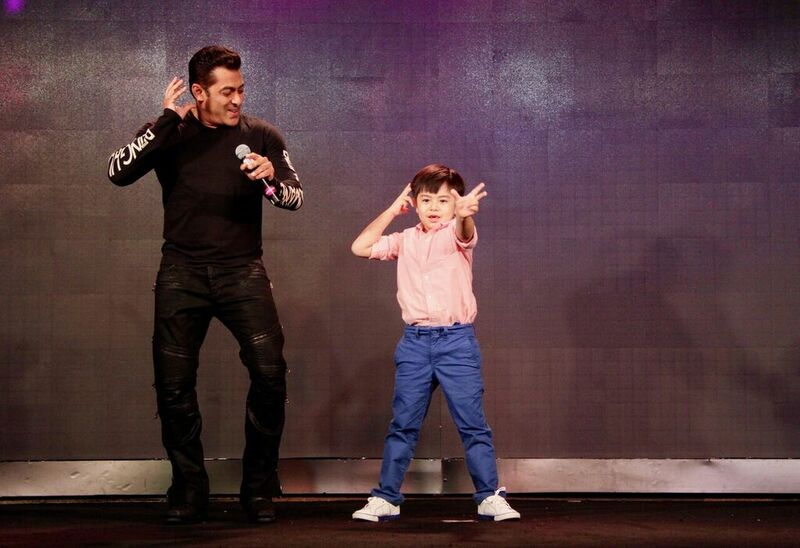 The highlight of the night was definitely Matin and Salman Khan’s impromptu jig.